Happy 10th Birthday to Pick Me! Design! Little did I realise when I took the scary leap into freelance design, that I would still be doing it 10 years later! And even more bravely, running my own graphic design and illustration business! I left the world of full time employment as a Senior Designer at Prima magazine, to freelance at various publishing houses and newspapers. I felt it would be a good challenge for me and great for my portfolio. I also thought I may eventually find a full time job on my travels! Problem is once I had a taste of freelance life, my enthusiasm for full time employment waned! The freedom and flexibility you gain as a freelancer, makes it harder for you to step back into permanent positions! In the last few years I wanted to have more creative control and art direct my own jobs, so this is when ‘Pick Me’ really came into it’s own. I now work directly with clients on a wide array of jobs designing and illustrating logos, flyers, brochures, stationery and digital artwork. Looking back on these last 10 years, I feel a real sense of achievement. There have been some really exciting jobs, where I would congratulate myself on winning the commission, but then I can’t deny that there weren’t times when I questioned whether I was doing the right thing. However each twist and turn of my self employment journey makes me more determined than ever! And I certainly couldn’t have done it without the help from my wonderfully supportive husband, family and my clients – without you, there is no Pick Me! 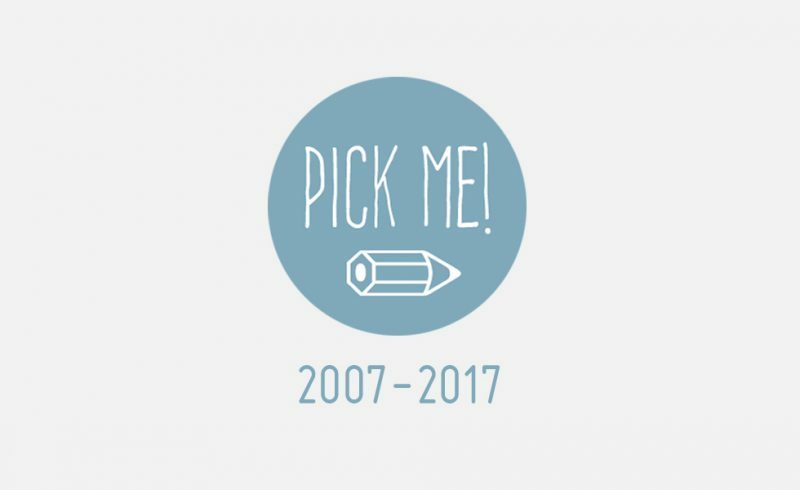 So thank you and here’s to 10 more years for Pick Me! Design!